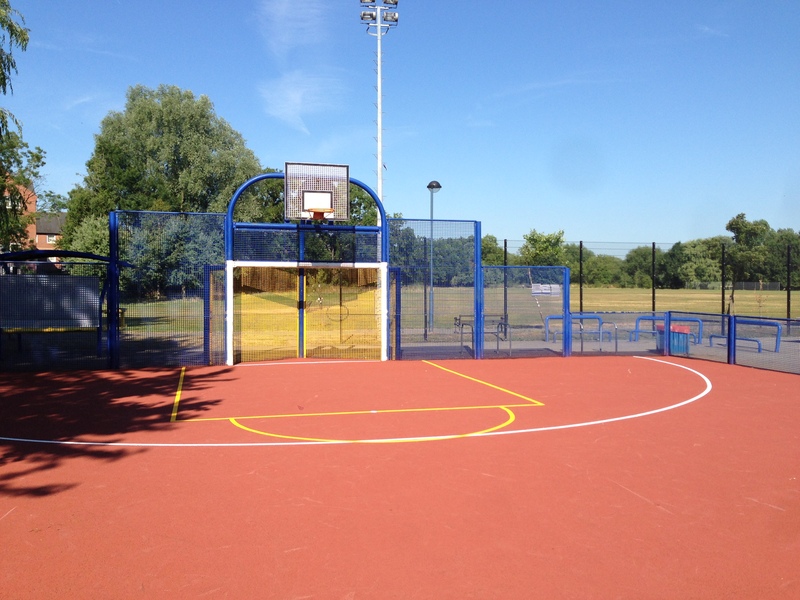 As specialists in basketball court services we carry out a number of projects such as full construction and painting of surfaces. This work may be carried out for many different facilities and some of our clients include secondary schools and local leisure centres. Whether you’re looking to build a completely new facility, or you just want to improve an existing one, we are here to help. You can speak with our team today and get more information and professional advice. Just send over your enquiry through the contact form and let us know what you need us to do. We’ll be able to have a look at your requirements and budget to decide on a suitable quote. 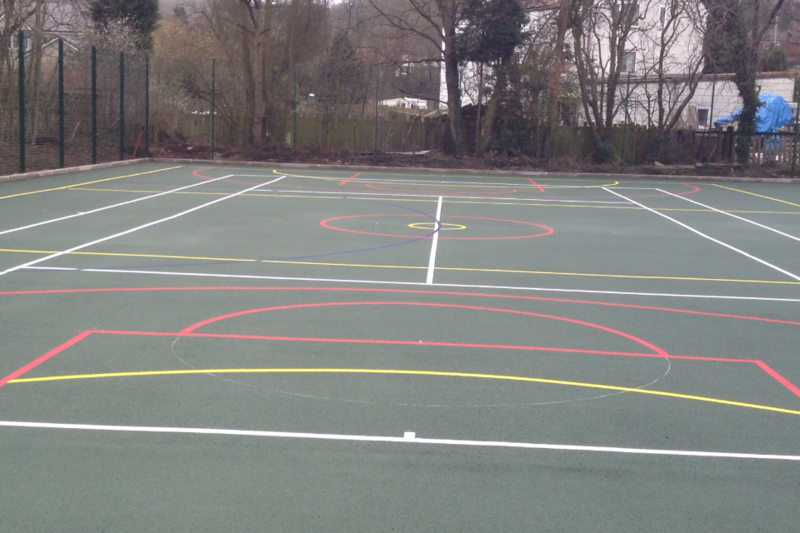 The most popular surfacing option for basketball courts is Type 1 macadam as this provides excellent slip resistance and ball bounce qualities which are essential for game play. 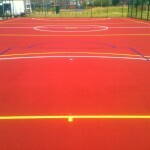 You will typically this surfacing specification at schools and sports clubs across the UK as it is a durable and cost effective option. 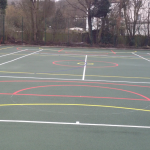 However, if you are looking to install a multi use games area we can also offer other basketball court surfaces such as Type 2 macadam and polymeric rubber which are ideal for other sports including tennis and netball. It really depends on the playing qualities that are needed for your facility as recreational courts will vary from professional standard surfaces. Just tell us how you plan to use the area and we’ll help you choose the perfect design. The specification for a professional standard facility will obviously be different from a school practise area. This is why we have a range of options to choose from so you can get the ideal playing qualities at a great price. 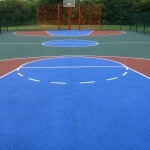 We include professional game line marking and anti slip paint coatings as one of our basketball services. This gives a great finishing touch to the surface, ensures the facility is safe for players and allows precise game play. 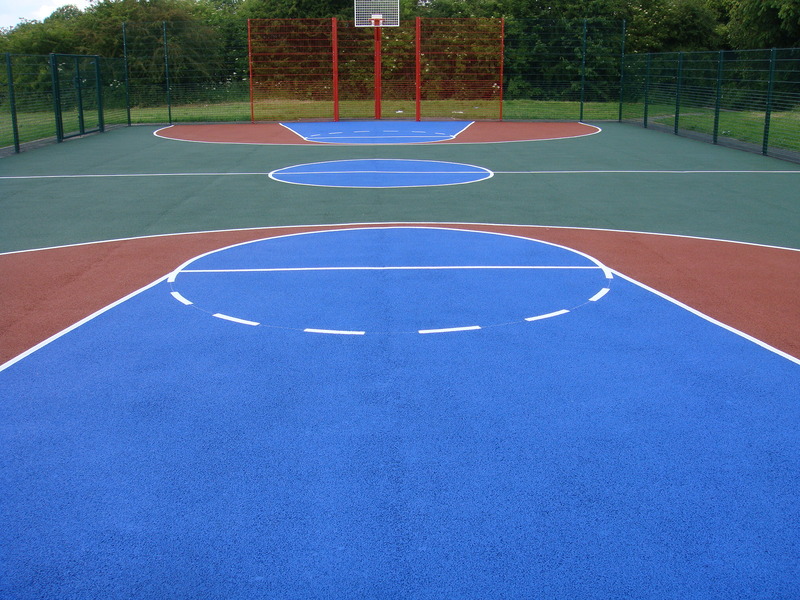 For a tarmac surface, the basketball court painting will usually be applied using an acrylic coating which adds anti slip qualities. For polymeric rubber surfaces, a polyurethane coating will sometimes be used instead. As well as colour coating the whole area, we’ll also apply basketball court line marking to accurately mark out the sports lines. This will typically be done in a contrasting colour like white to make sure they stand out clearly. 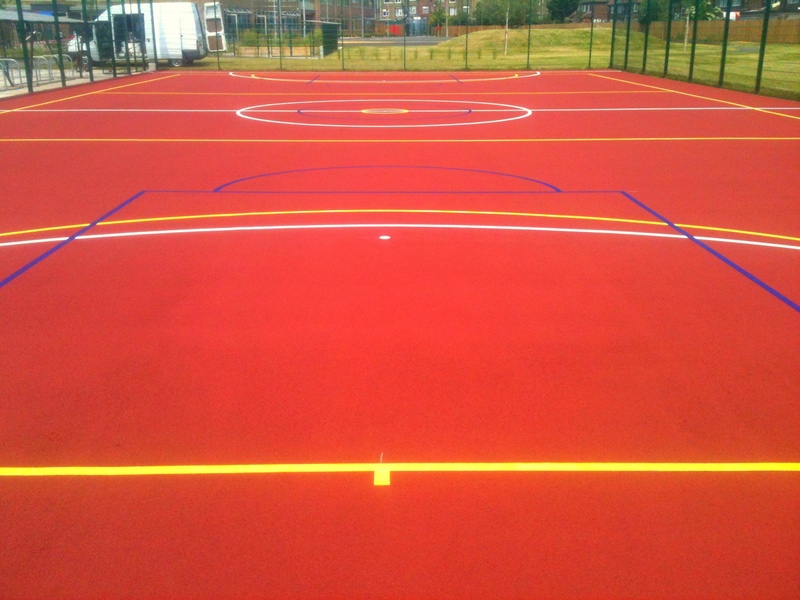 Paint coatings and line marking can be applied in a range of bright colours to suit your design specification and give a personalised touch to the sports facility. If the area is going to be used for other activities, additional markings can be added on top. 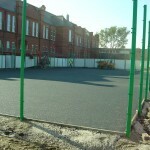 Our experienced team of installers can build a brand new sports surface for your organisation. This process will begin with excavating the ground to the required depth, then fitting a suitable sub base. Once this has done, we’ll install the chosen surfacing to fit the correct area size. 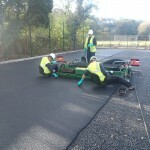 Macadam will be laid directly onto a stone sub base, whereas polymeric rubber will require a base of macadam to go down first. Whatever specification you choose to have, our experienced team will be able to install it and create the ideal facility. For a full basketball court construction project the specifications can vary, and we are able to alter them for your budget. This might include choosing the most cost effective surface type, reducing the size of the facility, or compromising on equipment to help keep costs down. Just let us know how much you are looking to spend and we’ll do our best to stick within your price range. It’s important to keep your sport surface well looked after to make sure the performance and safety characteristics are maintained for a long time. We offer basketball court maintenance to help you keep your sports facility in top condition. Whether it’s at a school, sports club or leisure centre, your surface should provide a positive playing experience and be kept safe for those who use it. Maintenance methods for this kind of facility can include regular basketball surface cleaning and brushing to prevent the build up of dirt and debris. It’s important to do this as it prevents any contamination which could potentially block up the surface and cause it to flood. We will also provide basketball courts repair for any damage which has been caused to the surface as a result of heavy use or vandalism. These services are available for different surface types so don’t hesitate to ask if this is something you need. 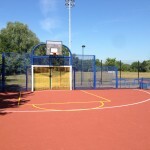 The costs involved with carrying out various basketball court services will of course be different for each individual project and the specification of the work. Prices can be dependent on a number of variables including the type of surfacing, the conditions of the existing area and access to the site. A quote can be tailored to meet your requirements and your budget to ensure you get the best end result at a price your organisation can afford. Court construction prices can also be managed by deciding on the extra equipment you need to have installed, for example basketball fencing, nets and floodlights, compromising on these items can help keep costs down for the overall installation. The cost of basketball court services and maintenance can be managed by carrying out regular cleaning and proactive maintenance to keep the facility in good condition. Properly looking after the court will reduce the likelihood of it needing repairs and resurfacing which can be expensive. Having a well maintained facility is an investment for your organisation as it can help generate extra revenue, so it’s vital not to overlook the importance of taking good care of it. You also want to ensure complete safety for players who will be using the area during practise sessions and matches. You can talk to one of our experts today if you’d like some more information on everything we have to offer. 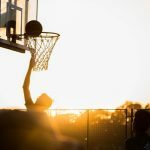 The costs of basketball court services will depend on the work that is required, but we’d be happy to give you a quote. Fill in our contact form with all of the details including your location, budget and an area size for the project so we can give an accurate price. From working with various clients across the UK, we have gained plenty of knowledge and experience in these projects. Whether it’s constructing a completely now sports area or carrying out a routine cleaning job, we are on hand to help.